Even though this movie, directed by Shana Feste knows how to pull on your heart strings, it’s actually a very enjoyable film, given its dark theme and issues of mourning. 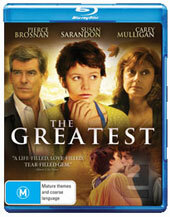 The story revolves around the Brewer family which include Allen (Pierce Brosnan), Grace (Susan Sarandon), Ryan (Johnny Simmons) who is their youngest son and finally Bennett (Aaron Johnson), their oldest. The film begins with Bennett taking Rose (Carey Mulligan – Wall Street: Money Never Sleeps), his new girlfriend home after a passionate night of confessions of love and human bonding. However on the way the home, Bennett decides to stop in the middle of the road in their car to share an intimate second and as Bennett professes his love, they are violently hit by another car. Bennett dies. This is where The Greatest begins as the Brewer family is falling apart at the edges. Allen attempts to ignore his feelings and never mentions his son, whereas Grace seeks answers on her son’s final moments, visiting the man responsible for her son’s death who is in a comma. Then we have Ryan, the younger brother, suffering from drug problems and still jealous of his brother as he always received more attention than this brother, this family is more than just a dysfunctional and it appears that Bennett was the glue that held them all together. As they descend into their own versions of grief, Rose comes to the family for help. She informs them that during their first night together, she has become pregnant and wants to keep Bennett’s child. This causes their already volatile relationships int he family to become strained even more, however this individual with the last link to Bennett helps this family move on and although predicable at times, it’s quiet an emotional and endearing story. The video and audio quality is quite stunning on Blu-ray and is definitely up there with the best of them. Deep levels of black, vibrant colours, sharp images which is complimented well by the FULL HD soundtrack. This is how drama movies should be made and even though at times, The Greatest is clichéd, it really showcases Carey Mulligan as a superb up and coming actress!